No matter the activity you choose, the time of day when you work out should be considered. The hours between 10:00 a.m. and 3:00 p.m. are the hottest, putting you at risk of dehydration and heatstroke, so you should work around these hours if you can. A run in the morning gets your day off on the right foot. A physically productive AM gets your mind ready for the rest of the day. On the flip side, exercising once you get home from work can be a release from the stresses of your professional life. While motivation is sometimes in short supply once you get off work, an exhausted body and mind make for a sound night of sleep. When you are faced with the heat of the day, make sure you know the signs that you need to slow down or stop your workout. Heat cramps usually are the first sign when your body has had enough. 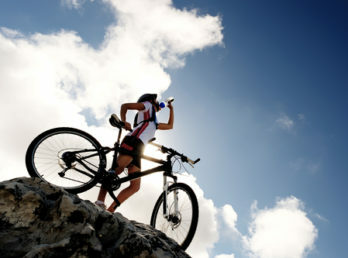 If you feel muscle spasms while on the trail or on the bike, stop and message your muscles. A good stretch doesn’t hurt either. Don’t continue exercising once your heat cramps go away for a couple hours. Heat exhaustion is another concern. If you feel dizzy or feel light headed, vomit or become chilled despite the heat, you may suffer from heat exhaustion. Stop your exercise immediately and find a cool place. Drink plenty of fluids to prevent dehydration. If you ignore these signs, heatstroke can be life threatening and requires immediate medical treatment. The symptoms typically include a fever of over 104 degrees, vomiting and a rapid pulse. When you spend hours in the sun you should protect your skin and eyes from harmful UVB and UVA rays. UV rays are good for your eyes in moderation, but too much exposure has been found to increase the risk of cataracts and other eye problems later in life. A pair of polarized sunglasses that filter out 99 or 100 percent of UV rays protects your eyes from damage while you’re out in the sun. You also should protect your skin from the sun. UVB rays are responsible for sunburns, and UVAs can cause lasting damage and increase your chances of developing skin cancer. A high-SPF sunscreen (30 or above) decreases your chances of getting a sunburn. However, it can wear off, sweat off or wash off, so you need to reapply often (every one to two hours). Don’t wait until you look a little pink or red, either. Make sure you reapply sunscreen before you feel the burn.